Crystal Shimmer 5 tier Wedding Cake. 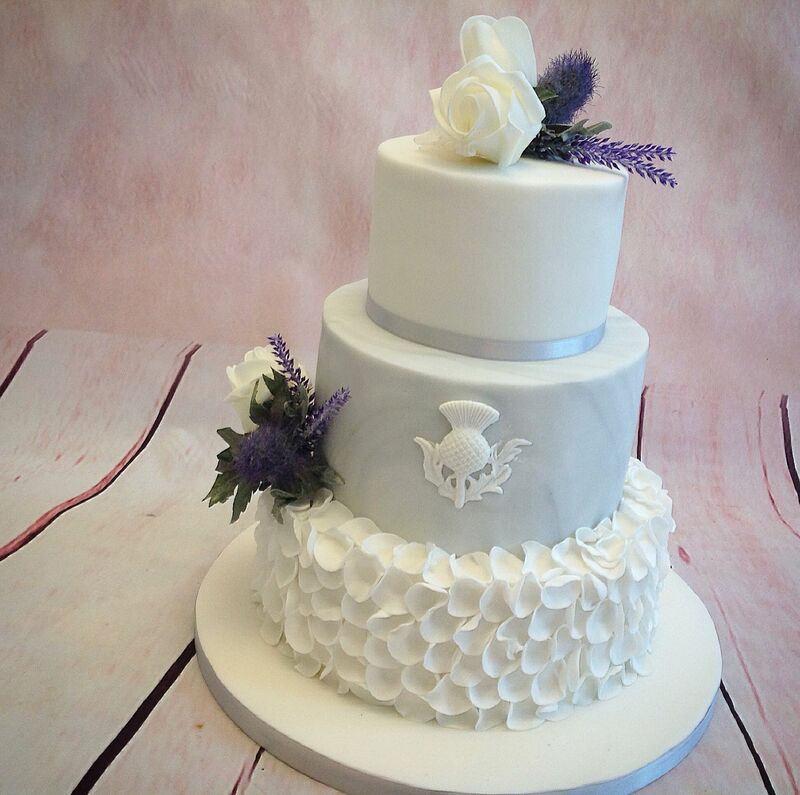 If you are looking for a design that is simplistic, yet elegant, then this is the wedding cake for you. Our bride to be wanted something that would replicate the details of her wedding dress. After discussing the detail requirements with the bride and groom, we designed this wedding cake with the decoration that was keeping with their requirements. The cake is set on our bespoke crystal effect ice drop cake stand. 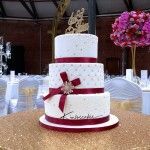 The flavours of this beautiful Crystal Shimmer Wedding Cake consisted of; Madagascan vanilla, Fresh luscious lemon sponge, Amaretto and Cherry, Belgian Chocolate, and fresh Strawberry Sponge. With over 40 freshly baked flavours to choose from, both you, and your guests will be spoilt for choice on the day. Each tier has been enrobed with an ivory fondant. 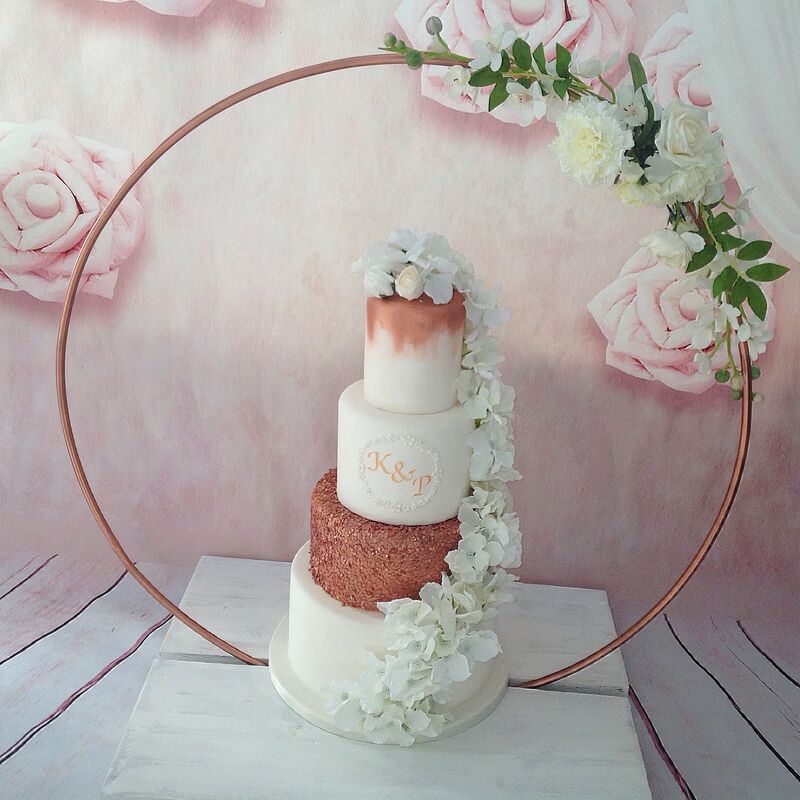 The tiers are then decorated with a string of diamante’s around the base of the 10, 8, 6- and 4-inch tiers, and around the base of the cake board. For the decoration for the second tier, we made a fondant bow, together with a diamante and pearl brooch in the centre. This was added to the base of the cake. The whole cake was then finalised with a dusting of pearl lustre to give a shimmer and shine silky look. To finalise the design, we then added edible white lace appliques to the top three tiers, together with a line of lustred pearls, to replicate the buttons on the bride’s dress. 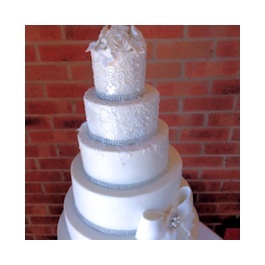 The wedding cake was then delivered and set up at Morley Hayes Wedding Venue, Derbyshire.